There’s a glut of interesting auctions at Christies in London at the end of the month, including vintage film posters modern-era prints and modern design. But the most interesting of all could be the 20th Century Fashion and Accessories sale. There’s over 400 lots, covering fashion from the 1920s to the 1980s (yes, that’s now vintage). The 60s and 70s make up the majority of the sale – and the majority of that is for women – the men’s selection is limited to some 60s button-down fashion shirts and a number of tie and shoe lots. Prices vary considerably, some with high estimates because of provenance from celebrity ownership, others high because they’re currently hip (Biba – of which there’s plenty). However, you can pick up some 60s high fashion at a decent price. 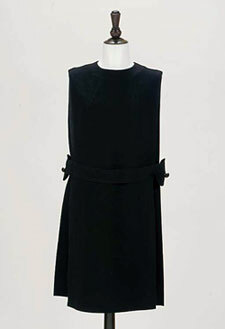 This 1969 black wool tabard dress by Pierre Cardin has loose panels bound with a belt featuring spherical buttons at either side. Very much of the era, but still looking sharp today, it’s estimated at around £250-£350. Not much difference from buying a new designer piece – in fact, probably cheaper. The sale at the South Kensington site on September 28th.